Cartilage is smooth tissue that covers the bone in a joint. Osteoarthritis (OA) is the wearing down of cartilage over time. OA can cause pain and limit movement. Cartilage acts as a cushion for the bones. It also helps bones move smoothly over each other. High impact, stress, and pressure on the joint can wear down the cartilage. The damage worsens over time. For some, the cartilage may completely wear away. This leaves the bone surfaces bare which causes pain and trouble moving. Wear and tear of the joint is a part of aging. Injuries to the joint, weak muscles, or other health problems can speed up and worsen the damage. You will be asked about your symptoms and past health. A physical exam will be done. The doctor can often diagnose OA based on your symptoms. Extra weight can increase pressure on the joints. This may speed up wear and tear. The closer you are to your ideal weight, the better it will be. If you are overweight, losing any weight can lessen the stress on your joints. A dietitian can help you make meal plans. Muscles affect how the joints line up and how they move. It can also affect how much stress is placed on your joints. Strong muscles can decrease the wear and tear with each movement. They can help to slow the progress of OA. Strong muscles related to the joint may also decrease OA pain and make movement easier. Low impact may be a good way to start. For example, swimming and water aerobics improve muscle health with less impact on the joints. Ask a doctor or an exercise specialist for help to create a program that works for you. Heat may help loosen stiff joints and help you move easier. Heat may be given through hot water bottles, warm soaks, paraffin, or heating pads. Ice may help to decrease swelling and pain. It may be most useful after activity. Do regular exercise, such as walking, stretching, swimming, or yoga. Limit repetitive motions. Avoid risky activities that may lead to joint injury. This is even more important after age 40. 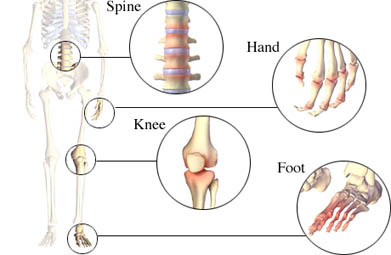 Degenerative arthritis (list of topics). EBSCO DynaMed website. Available at: http://www.ebscohost.com/dynamed. Updated May 21, 2014. Accessed May 11, 2016. Hochberg MC, Altman RD, et al. American College of Rheumatology 2012 recommendations for the use of nonpharmacologic and pharmacologic therapies in osteoarthritis of the hand, hip, and knee. Arthritis Care Res (Hoboken). 2012;64(4):465-474. Fernandes L, Hagen KB, et al. EULAR recommendations for the non-pharmacological core management of hip and knee osteoarthritis. Ann Rheum Dis. 2013;72(7):1125-1135. Living with arthritis. Arthritis Foundation website. Available at: http://www.arthritistoday.org/about-arthritis/types-of-arthritis/osteoarthritis. Accessed May 11, 2016. Osteoarthritis. National Institute of Arthritis and Musculoskeletal and Skin Disorders website. Available at: http://www.niams.nih.gov/Health%5FInfo/Osteoarthritis/default.asp. Updated April 2015. Accessed May 11, 2016. 10/21/2008 DynaMed's Systematic Literature Surveillance http://www.ebscohost.com/dynamed: Fransen M, McConnell S. Exercise for osteoarthritis of the knee. Cochrane Database Syst Rev. 2008;CD004376. 12/11/2009 DynaMed's Systematic Literature Surveillance http://www.ebscohost.com/dynamed: Rutjes WJ, Nuesch E, Sterchi R, et al. Transcutaneous electrostimulation for osteoarthritis of the knee. Cochrane Database Syst Rev. 2009;(4):CD002823. 10/15/2010 DynaMed's Systematic Literature Surveillance http://www.ebscohost.com/dynamed: Wandel S, Jüni P, Tendal B, et al. Effects of glucosamine, chondroitin, or placebo in patients with osteoarthritis of hip or knee: network meta-analysis. BMJ. 2010;341:c4675. 11/15/2010 DynaMed's Systematic Literature Surveillance http://www.ebscohost.com/dynamed: US Food and Drug Administration. FDA clears Cymbalta to treat chronic musculoskeletal pain. US Food and Drug Administration website. Available at: http://www.fda.gov/NewsEvents/Newsroom/PressAnnouncements/ucm232708.htm. Updated November 4, 2010. Accessed May 11, 2016. 11/29/2010 DynaMed's Systematic Literature Surveillance http://www.ebscohost.com/dynamed: French HP, Brennan A, White B, Cusack T. Manual therapy for osteoarthritis of the hip or knee: a systematic review. Man Ther. 2011;16(2):109-117. 7/15/2013 DynaMed's Systematic Literature Surveillance http://www.ebscohost.com/dynamed: Dilek B, Gözüm M, Sahin E, et al. Efficacy of paraffin bath therapy in hand osteoarthritis: a single-blinded randomized controlled trial. Arch Phys Med Rehabil. 2013 Apr;94(4):642-9. 6/18/2014 DynaMed's Systematic Literature Surveillance http://www.ebscohost.com/dynamed: MQIC guideline on medical management of adults with osteoarthritis. Available at: http://www.guideline.gov/content.aspx?id=47806. Updated August 1, 2013. Accessed June 29, 2015. 9/3/2014 DynaMed's Systematic Literature Surveillance http://www.ebscohost.com/dynamed: Zhou ZY, Liu YK, et al. Body mass index and knee osteoarthritis risk: A dose-response meta-analysis. Obesity (Silver Spring). 2014 Jul [Epub ahead of print]. 1/5/2018 DynaMed Plus Systematic Literature Surveillance http://www.dynamed.com/topics/dmp~AN~T916957/Injection-therapy-for-osteoarthritis-OA-of-the-knee : Krsticevic M, Jeric M, et al. Proliferative injection therapy for osteoarthritis: a systemic review. Int Orthop. 2017 Apr;41(4):671-679.